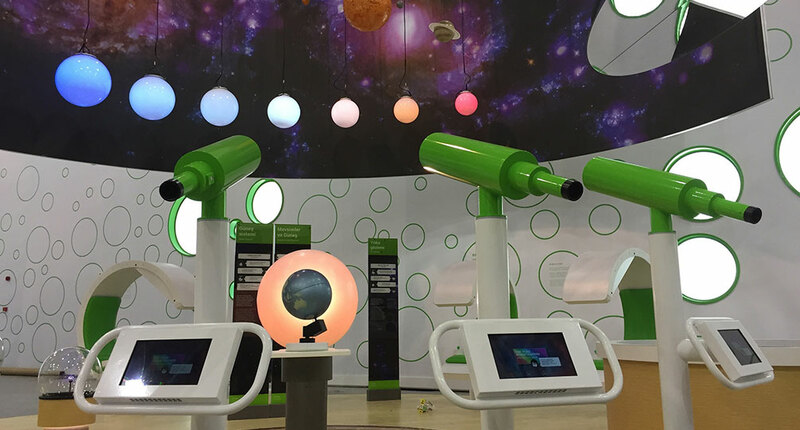 A multiplayer game that’s one part science and one part science fiction helps get visitors excited to learn more about the universe. 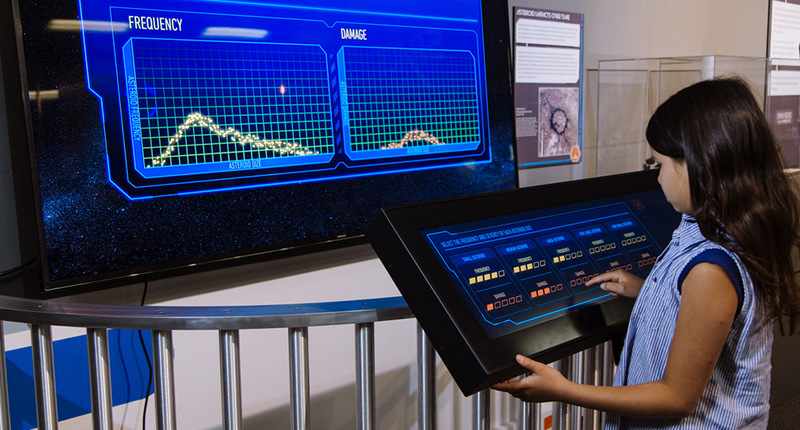 As visitors command their own space ship and attempt to discover an extra-solar planet in the game Beyond Our World, they learn about the many elements of our complex universe. 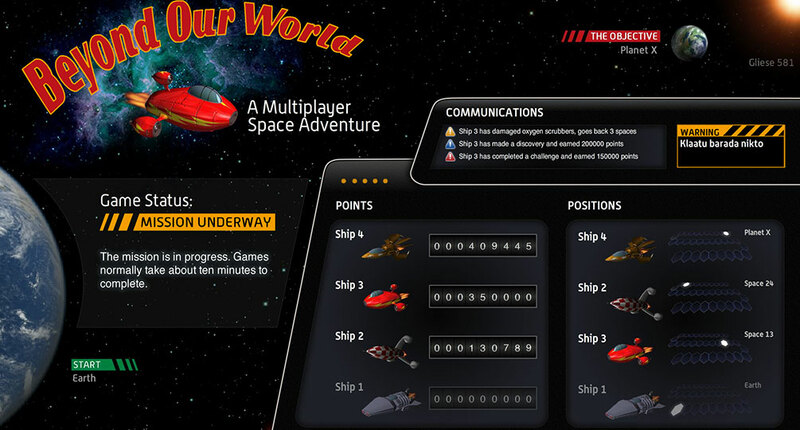 With four stations (space ships) and a giant scoreboard, this network-based board game lets visitors play against each other. 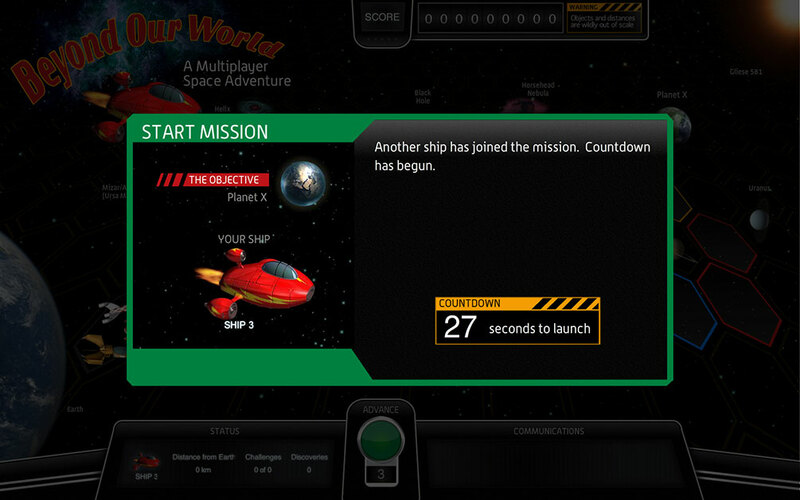 The object of the game is simple: guide your ship out of the solar system to reach a new planet. Visitors rack up points along the way as they answer questions, make discoveries and avoid a series of hazards. The big board keeps track of the ships’ locations and lets everyone know how each ship is faring. Ideum worked with Adventure Science Center to paper prototype the game long before we began to develop the software. The paper version of the game drove the development process. Once the paper version was structured properly, we could then focus on the software development and communications aspects of the game. The Adobe Flash Media server powers the game and each client connects to the server as new games are initiated. 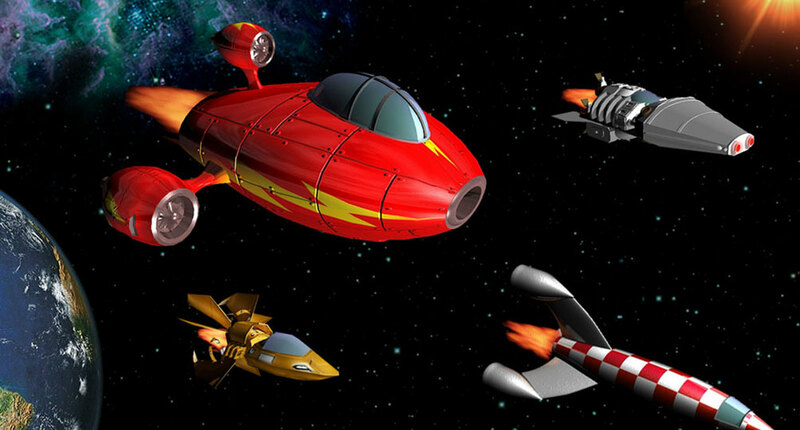 3D graphics with a retro twist were developed for the game, giving it a fun and inviting feel. The Beyond Our World software was developed with Adobe Flash and uses an XML structure, making all the content external to the application and easily changed. The game parameters are also externalized and can be changed to tweak game play. 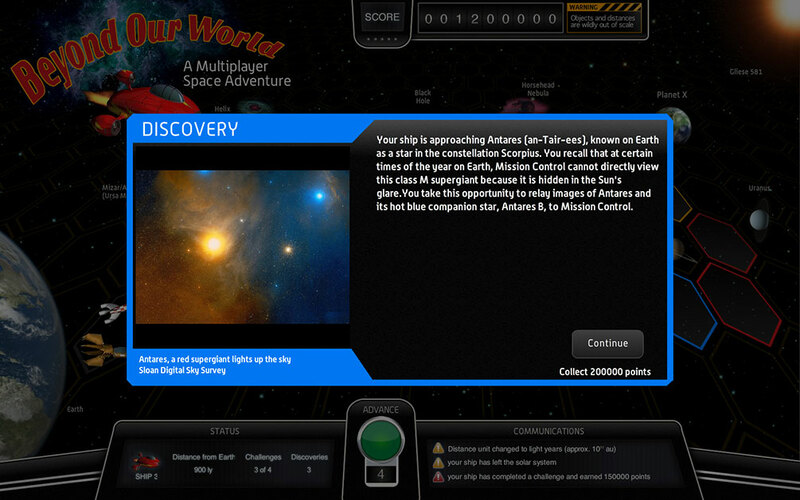 Beyond Our World is part of the 2009 expansion of the Sky and Space Gallery at the Adventure Science Center in Nashville, Tennessee. 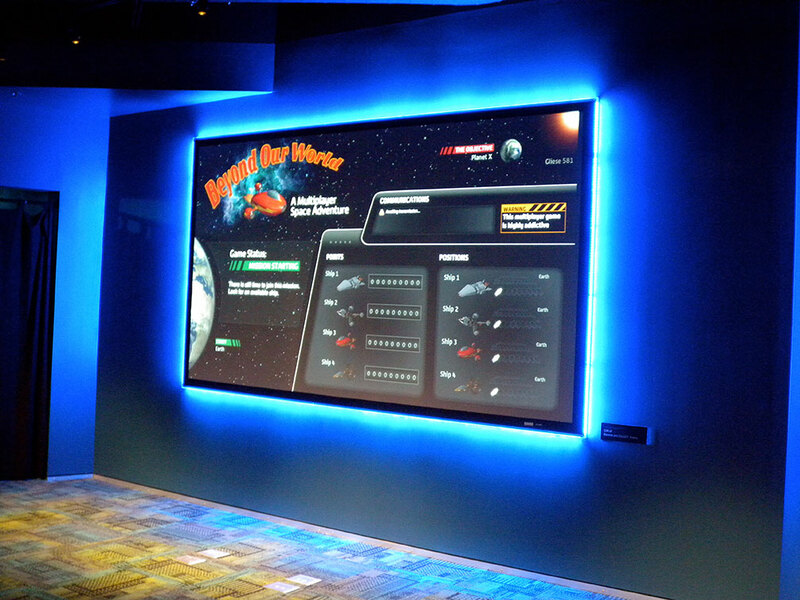 Each ship's status is displayed on a giant screen. Every player pilots a unique spacecraft. Some missions are hazardous, but all are educational. 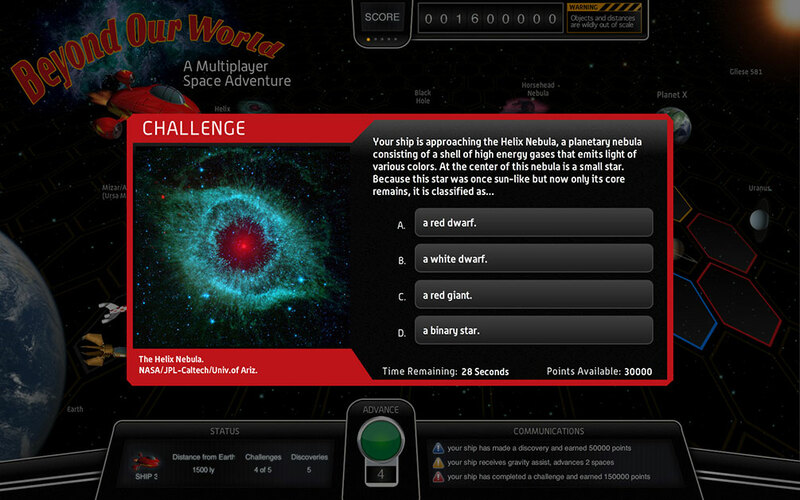 Quizzes earn points for knowledge-hungry space jockeys. 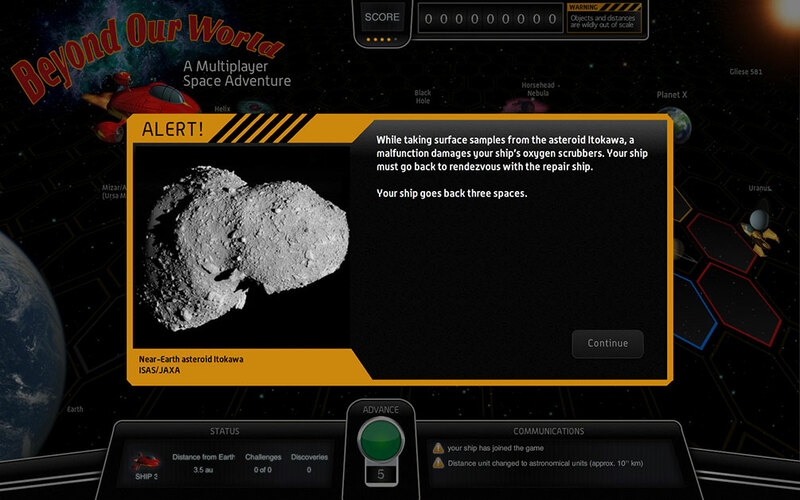 Missions help players learn about real interstellar objects.